Ponderosa Garage Doors & Repair loves to meet the unique tastes of our customers and contractors, rather than saying “that’s not possible” or “that’s not available.” We put our 18 years of experience to work to find solutions and unique options for you. One of the greatest ways to make a house your own or to add some distinction to your home is by giving it a “face-lift.” A new and exceptional garage door is a surefire way to make a statement. There are garage door designs to fit almost anyone’s imagination and style of home. 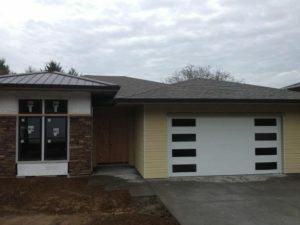 In the photo we see a home being built by Rick Waters Custom Builders out of Scappoose, Oregon. Installed on the home is a CHI model #2286, a contemporary/flush, double-sided steel insulated door with a distinctive glazing pattern from top to bottom at each end of the sections. The windows are double-pane insulated glass with “tempering” for safety. New garage doors and openers make your home more unique, fun, exciting and safer for your whole family.